Digital disruption is continually infusing itself into nearly every aspect of the way all industries and business functions go about their work and the management of IT talent is perhaps more affected (and affected more quickly) than many functions. The time is now to set your regimen and get 'talent fit' for the future. Information technology leaders for too long have not given their organization’s talent its due diligence. We have not exercised the muscles that our organization possesses to deliver the most value for our customers. Digital disruption is continually infusing itself into nearly every aspect of the way all industries and business functions go about their work and the management of IT talent is perhaps more affected (and affected more quickly) than many functions. The time is now to set your regimen and get “talent fit” for the future. Start by realizing that there’s already value available where you are today – but – you need to flex your talent. Take a look in the mirror and consider the capabilities your business needs to perform in today’s and tomorrow’s dynamic business environment while mapping your existing workforce to a model that allows each person to achieve their best – and pushes the organization forward in an innovative way. Oftentimes, peoples’ skills are either not aligned to the work they are doing or they don’t perceive the work they want to do to be available. CIOs have to dynamically shape IT as a platform for exciting and innovative work that delivers for their people and the business. 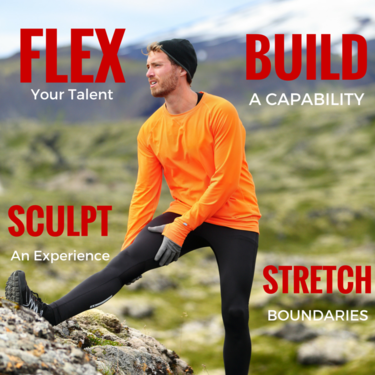 We can’t just flex and expect to build muscle which means one of the most important things we have to do is build – in this case – a capability around IT talent. Too often IT organizations leave it to HR to do all the heavy lifting in terms of developing talent strategies and managing the “people lifecycle.” Instead, IT needs a strong partnership not only with human resources but across all of the organizations business lines and functions to support and cultivate a set of activities that allow the organization to capture value from its holistic talent value chain but also to adapt to the changing nature of technology in the business. Digital is opening the doors for every function to be its own IT organization – CIOs will only create value in the future by creating a flexible and shared talent ecosystem across the business. Certainly building a capability is what creates a platform to sustain value creation within a talent ecosystem but leaders in information technology must also sculpt a rich experience for their employees. In many industries and companies, the “fun technology” around collaboration, innovation and digital are being increasingly driven in the lines of business, marketing, or even operations functions. The IT department is looked at less favorably by younger employees keen to make their mark and even by more seasoned veterans excited about shaping the future. IT has to change its image both in the eyes of prospective talent and key players throughout the enterprise by making existing work more social and collaborative, by creating more engagement with the business on innovation and ultimately by creating new work and new ways for team members to contribute. The final stage of our talent regimen is stretching the boundaries not only of people themselves but of the overall ecosystem and talent strategy. There is significant unleveraged value both in talent pools of existing people in the enterprise – read that IT people’s deep knowledge of the business and processes – but also amazing opportunity’s to reshape our approach to work, to sourcing talent and ultimately to configuring talent in a way that serves to both attract and retain the best people while creating tremendous value for the enterprise. An effective talent workout, if you will, is not complete or most effective by doing any one piece. As CIOs and IT leaders – we need to focus on shifting our collective focus to flexing our own talent, building capabilities, crafting rich employee experiences and ultimately stretching the boundaries of what we’ve traditionally defined as “managing talent.” If we think about the broader changes driven by digital and other workforce disruptions – the opportunities abound for us to create and capture tremendous value for our companies.